This last weekend we made the trip Greenville, OH to visit – but more importantly to get a Maid-Rite. 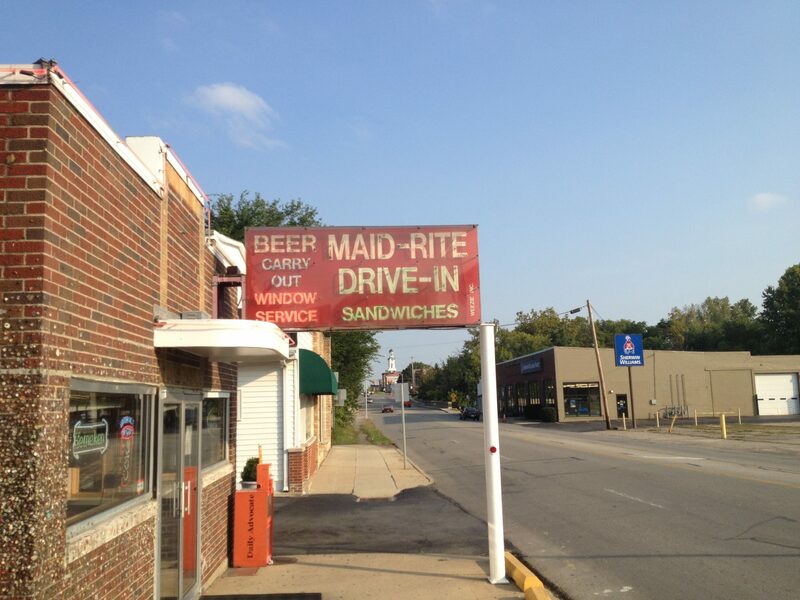 For those uninitiated, a Maid-Rite is a loose meat sandwich that is best described as a sloppy joe without the sauce. It’s a big deal in Greenville and one of those locals flavors that only exist trapped in time. My parents grew up in Greenville and every year we would go down and visit my grandparents, swim at the pool which Grandpa managed (for me it was the new pool – though I always hear how great the old pool was), and eat at Maid-Rites. What started as a traditional turned into a craving. It was something that every once in a while you must have. You will go to satisfy the urge even if the drive is 3 hours each way. While we were sitting in the restaurant I realized that eating there with my son that at least four, possibly five, generations have eaten there. Since it is a very tiny restaurant we probably all sat in the same spots. I know for fact that my grandparents, my father, my son, and myself have eaten there. I’m assuming that at some point my great-grandfather came to visit the family from Grove City and had one also. As much as the restaurant is a city tradition, for some it becomes a family one. There is one cardinal rule to eating at Maid-Rites – no Ketchup. While we are at it there are no fries either. The standard sandwich comes with mustard, pickles, and minced onions. You can also order one with cheese. I’ve always had pop with mine, but my wife and son tried a milkshake on the recommendation of my godmother. Their shakes are some of the best I have ever had. However, I’m still going to drink pop with my sandwich. There is one other part to this restaurant’s tradition. The gum wall. Yes, that is a picture of years and years of gum stuck upon the wall. Some of the pieces I stuck on there as a child might even still be there. It’s crazy. 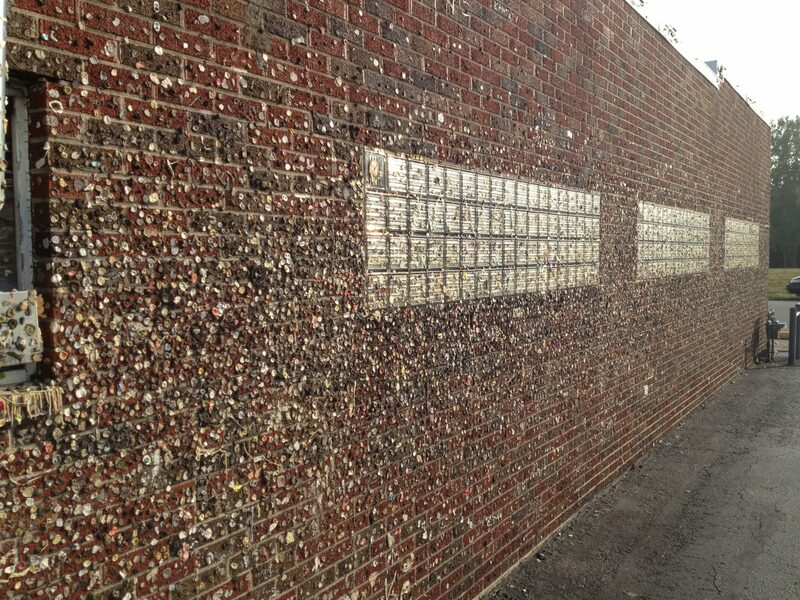 I’m sure when the gum wall started that it drove the owner’s nuts. They now however embrace it. It is one of the unique things that has made them famous. Boil (yes, boil) the beef in a pot with enough water to just cover the meat. Boil until the pink is gone, then drain. Put drained beef in a large skillet and add all remaining ingredients. Simmer and stir, continually breaking up the beef until crumbly and the beer is almost evaporated. Serve on steamed buns, topping with cheese, diced onion, mustard and dill pickles to taste. In Iowa there is a major chain of Maid-Rite restaurants that started in the 1920’s with a similar flavor and style sandwich. The Greenville store has existed since 1934. Obviously at one point there was a franchise deal, but that seems to have dissolved decades ago. The only restaurant the corporate chain has in Ohio is located in Piqua, about twenty miles away from Greenville. I’m guessing corporate attempted to cash in to the Greenville stores popularity – but it can’t touch it from what I’m told. My hometown of Vermilion, OH didn’t have any place that was similar. It has its own unique restaurants – but none that have the local appeal as this one did. The closest we could claim was Dairy Dock. Amherst, OH about fifteen miles away does have a similar experience store called Hot Dog Heaven. Being right down the road from the local high school it is regularly packed every day of the week. It’s another small restaurant with rabid fans. I sometimes get similar cravings for Hot Dog Heaven – my other Grandparents live in Amherst – so I had about equal exposure as I did to Maid-Rites. Home towns with unique flavors are always fascinating to me. The town I live in now doesn’t have anything that comes close. There is a frequented hot dog stand everyone visits. It doesn’t however have anything on Hot Dog Heaven. We also have nothing that comes close to a Maid-Rite. If you ever have a chance to eat there, I highly recommend it. There are few places that you can say that at least five generations of family has dined at over a fifty year span.